After two recipes of Italian descent, it’s time to get back to basics. I grew up in Vendée. Vendée is a part of France famous for its beaches, its bocage, religious wars as well as staunch royalism and opposition to the French revolution, which resulted in a couple of massacres. As a kid, it was a really great place to grow-up. I would spend my summers at the beach, whether it was to work summer jobs or just hang out with friends. In fact, my high-school was so close to the sea-front that it was possible to go there at lunchtime, eat on the beach, go for a swim and be back at school for afternoon classes! 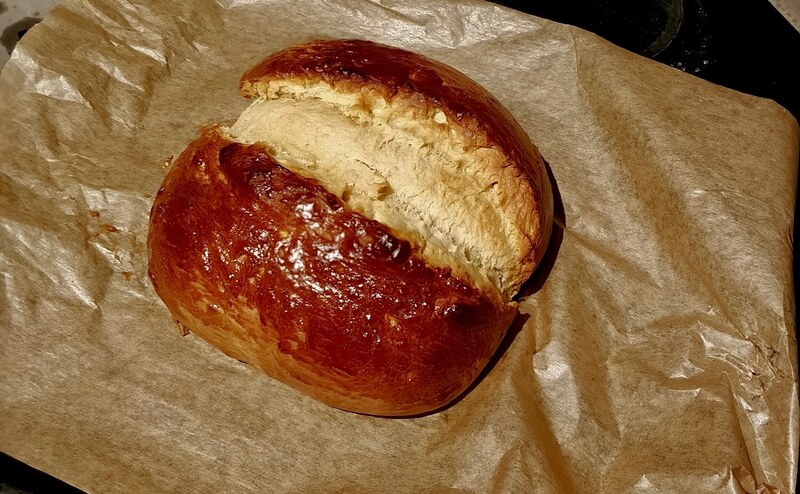 Food-wise, Vendée is famous for its seafood, ham, préfou (warm bread with butter and garlic) and a few other things… In the end, there are few things Vendée does better than brioche, and my favorite kind is “Gâche”. I’ve been eating gâche ever since I was a little kid. My parents (then myself) always bought it from the same bakery. Last year, my life took a turn for the worse when this bakery went out of business. I tried getting my gâche from different bakeries around my hometown, but nowhere made one as good. After a few failed attempts to find the perfect replacement, I decided to try it myself. Gâche should be a very dense brioche, slightly crumbly and a bit on the drier side, and the recipe I’m going to give you today achieves just that. Split the vanilla pod in 2 length-wise, and scrape the seeds. Bring the milk with the vanilla seeds, and let it cool down. Once the milk has cooled down, pour in a bowl half of the milk with the rum, yeast and crème fraiche. Mix really well, and let sit for 5 minutes. Sift the flour in a large mixing bowl. Make a well in the center, and add the sugar, butter, eggs and the rest of the milk. Mix with your hands until you get some sort of very crumbly dough. Add the milk, rum, yeast and crème fraiche mixture to the mixing bowl. Start mixing and kneading the dough with your hands. At first, it will be very sticky (and a bit gross looking), but as you knead the dough will take the right texture. This will take around 10 minutes of constant kneading. Place a clean towel over the bowl, and let the dough rise for 5-6h. Once the dough has risen, knead it again. Here, the goal is to remove as much air as possible from the dough. Remember, we want a very dense texture in the final product! Mold the dough into a roughly oval shape, and placed it on a floured baking sheet. Let the dough rest for another 45-60 minutes. Preheat the oven to 180c. Beat the last egg, and use it to brush the top of the gâche. Use a knife to score the bread length-wise in the middle. Place the gâche in the oven for 35 minutes. Stab the gâche with a knife to check if it’s cooked. It should come out mostly clean, and definitely not sticky. Enjoy at breakfast, as an afternoon snack, or whenever, really. Protip: The gâche should hold for a few days if you wrap it up properly. If you don’t eat it before it dries up a bit (what’s wrong with you), it makes for a really, really good french toast. I also like to eat mine slightly toasted with some butter and jam… and my mouth is literally watering as I’m typing this.